mm in thickness. Multislice scanners allow for 1.25- or 1-mm scans. Similarly, increasing pitch from 1 to 1.7 on helical CT or to 3 or 6 on multislice CT increases speed and decreases patient dose. Diminishing scan rotation time from 1 to .8 or .5 sec increases speed further. Electron-beam CT allows for even more rapid acquisition. With each of these changes, there is a potential decrease in photon statistics and increased noise. This is especially detrimental in large patients, where scan parameters must be altered to increase the amount of radiation and thereby decrease noise. There is no universal agreement on the optimal time between onset of contrast injection and scanning. We utilize a preliminary time-density curve to determine the time of peak pulmonary artery enhancement. This utilizes 18 cc of contrast injected over 6 sec while the pulmonary artery is being scanned every 3 sec for 30 sec. 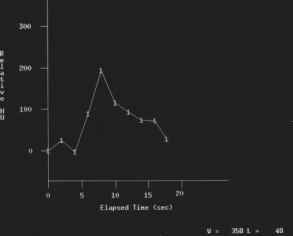 The contrast peak is then graphed and 5 sec are arbitrarily added to determine scan delay time (Fig. 2). In the vast majority of patients, the scan delay is 15 to 20 sec. Many centers empirically use a 15-to 25-sec delay without resorting to a time-density curve. 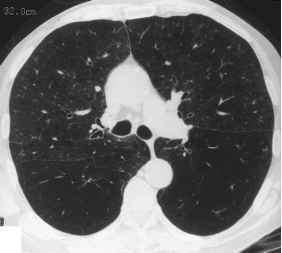 In an occasional patient, a specific area is not adequately evaluated on the initial CT because of suboptimal contrast enhancement or respiratory motion. A repeat focal scan through that area can be done using a supplemental 50 cc of contrast and a revised delay based on the prior scan. Figure 2 Time-density curve. (A) Typical normal time-density curve with peak opacification at approximately 10 sec. Five seconds is then arbitrarily added to determine scan delay. (B) Typical time-density curve in a patient with elevated right heart pressure. The calculated scan delay was 20 sec. 5-mm scans are obtained every 2 cm. Some centers scan continuously, obtaining complete imaging of the veins, but at the cost of increased radiation dose.